Steve Weis, who aged out of Southwind in 1999, sent in this picture as well as a positive review. "I just got my DCI finals DVDs 2003 and they are great. Thank you for putting together such a wonderful package. 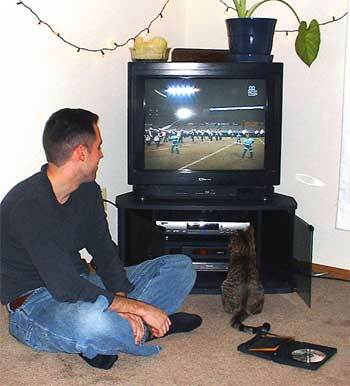 It was so enjoyable, even our kitten Gidget enjoyed the kaleidoscope sets of the Santa Clara Vanguard."